The SDG Policy Support System (SDG-PSS, http://sdgpss.net/en/) was launched Friday March 22, World Water Day, in English (with French and Spanish versions soon to follow) on the website of UNU’s Canadian-based Institute for Water, Environment and Health (UNU-INWEH). It draws on extensive research into a universal recipe for accelerating SDG-6 progress. It has been created by UNU-INWEH, the United Nations Office for Sustainable Development (UNOSD), the Korea Environment Corporation (K-eco), the Ministry of Environment, Republic of Korea, and national institutions from Costa Rica, Ghana, Pakistan, and Tunisia — five partner countries in the system’s development in 2017-2018. 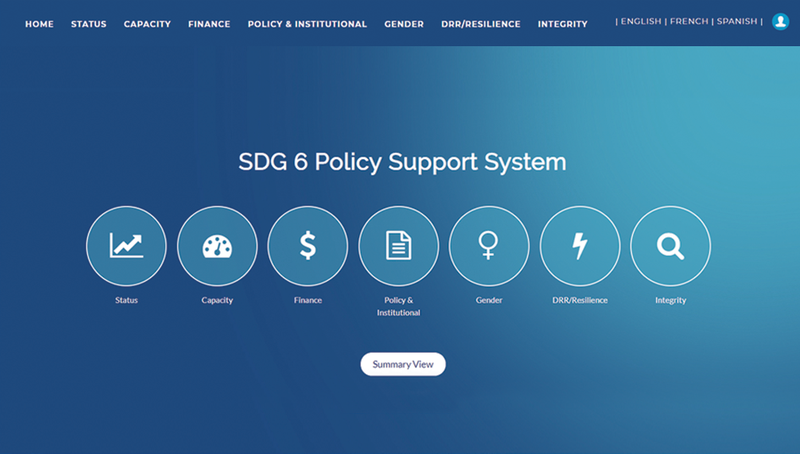 Free to use by anyone, and explained in an online training tutorial, the system and tools are built for water-focused professionals, practitioners, and policy makers interested in systematically producing reliable, comprehensive, policy-relevant evidence of the ever-shifting situation relative to the eight SDG 6 targets, and their 11 monitoring indicators. The system helps to assemble existing national data and translate it into the evidence needed to assess and monitor progress against SDG6. Capacity. Countries must have the ability to obtain, strengthen and maintain the capability to set and achieve their own development objectives. This is best done as a collaborative exercise including scientists, experts, policy-makers and decision-makers. Finding data may be the task of scientists and experts but selecting which data to adopt must cross the science-policy divide. Data and knowledge must be translated into evidence that is useful and relevant for its varied users. It is critical to create only one national evidence base for SDG 6, and to include only evidence that is validated and agreed on by all stakeholders – experts, scientists, policy-makers and decision-makers. This authoritative evidence base will then become the foundation for national discourse and decision making. The evidence base can be used to evaluate the current enabling environment against each target of SDG 6. Once the enabling environment has been measured, it can be managed. Collaboration across multiple sectors and with multiple levels of government is vital. Collaboration means that all key stakeholders are involved in decision processes and are working to the same priorities under relevant national development plans. At this stage, international expertise and support can be useful to support the progress of the national plan. Support from lead UN agencies is available to both high- and low-income countries. Putting the plan into action may require new mechanisms, the development of news skills and capacity, and the design of new policy and decision-making processes. To deliver SDG 6 success by 2030, these processes must be widely agreed by all and made a government priority. 6. Track progress in strengthening the six critical components and adjust plans as necessary over time. Collecting data, building evidence and analysing the six critical components is an ongoing process.